You are here: Church Letters and Welcomes > Custom Church Letters – We Write for You! 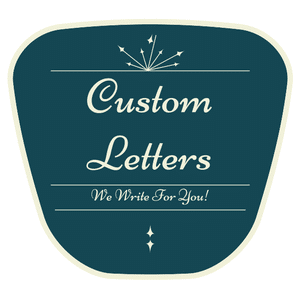 ​Custom Church Letters - We Write for You! ​Back for a limited time by request! If you have a pressing need for a letter to be written within a short period of time such as 24 or 48 hours, then you've come to the right place! We have been providing quality Church Letters on the web since 2005 and have been writing letters for much longer than that in various ministry positions such as Sr. Pastor, Youth Pastor, Music Minister and Singing Evangelist. Over 35 years of ministry experience has provided all the inspiration we need to get the job done right and on time for you! ​We cannot guarantee this purchase page will stay up long though because we prefer not to become too overwhelmed with custom projects, however, we have had many requests to bring back our Custom Church Letters so let's see how it works out! 1. Complete a purchase using one of the two options below.... 24, 48 or 72 hour delivery. 2. You will receive an email confirmation of ​your order. 3. Simply reply to the email with the basic idea of what you are looking for in the letter. The more details you provide will enable us to prepare a letter that will most likely work for you within the 24 to 48 hour time period. Please note: The "time clock" begins when we receive the email sharing your letter details. ​4. We will then email you the letter and you can easily copy it to your Word processing program for any further editing you may wish to make. ​Please note: We do NOT write letters of invitation to enter a Country for Ministry purposes. You will need to have the Ministry inviting you provide such a letter. If a purchase is made, your money will be refunded and the order canceled immediately.